'Heat Dome' Linked To Greenland's Biggest Melt In 30 Years : The Two-Way Satellite images show that from July 8 to July 12, nearly all of the ice sheet covering Greenland had experienced some melting. According to NASA, it's the biggest summer melt in more than 30 years. In these illustrations NASA produced from satellite data, the melt in Greenland on July 8 (at left) and July 12 are shown. According to NASA, "the areas classified as 'probable melt' (light pink) correspond to those sites where at least one satellite detected surface melting. The areas classified as 'melt' (dark pink) correspond to sites where two or three satellites detected surface melting." Last week there were the pictures of an iceberg twice the size of Manhattan breaking off Greenland's Petermann Glacier. Now there are NASA images showing that in four days earlier this month, "Greenland's surface ice cover melted over a larger area than at any time in more than 30 years of satellite observations." The space agency adds that "nearly the entire ice cover of Greenland, from its thin, low-lying coastal edges to its two-mile-thick center, experienced some degree of melting at its surface, according to measurements from three independent satellites analyzed by NASA and university scientists." The changes happened from July 8 to July 12. NASA says "this extreme melt event coincided with an unusually strong ridge of warm air, or a heat dome, over Greenland. The ridge was one of a series that has dominated Greenland's weather since the end of May." Wired writes that "while no one event can be blamed on climate change, the melt is consistent with rising global temperatures." 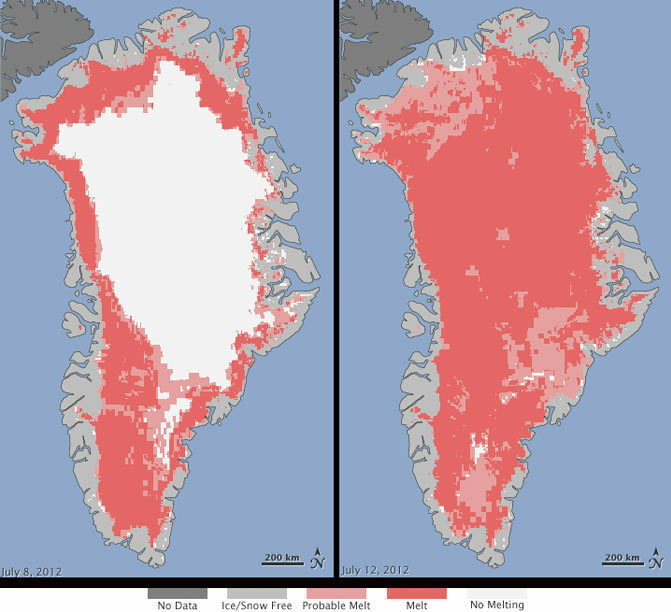 The Guardian says "the rapid melting over just four days was captured by three satellites. It has stunned and alarmed scientists, and deepened fears about the pace and future consequences of climate change." According to NASA, "researchers have not yet determined whether this extensive melt event will affect the overall volume of ice loss this summer and contribute to sea level rise." In most years, much of the water from a summer ice melt "quickly refreezes in place ... [or] is retained by the ice sheet." Some though, NASA says, "is lost to the ocean."